70/126 Kim Hollis The characters are engaging and Emmanuelle Béart proves again to be a top-notch performer. This story, set in Paris in June 1940, is based on the novel by Gilles Perrault named Le Gargon Aux Yeux Gris (The Boy with the Gray Eyes). If you remember your World War II history, this is about the time that the Nazi armies invaded France. 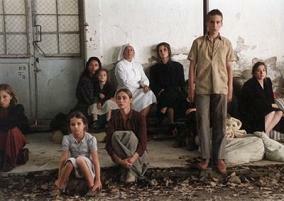 Our story follows a woman named Odile (Emmanuelle Beart) and her two children as they try to flee the invading armies. As they try to escape down a crowded highway, German Stukas shoot up the road, destroying Odile’s car and all their possessions in the process. But where can they find safety? A fellow refugee named Yvan (Gaspard Ulliel) leads them into some woods next to the road. They have no choice but to follow him. They spend the night out in the open and at dawn the world around them is revealed. There is much death and destruction, but Odile must press on for her childrens’ sake.